You are currently browsing the tag archive for the ‘Thomas Willis’ tag. 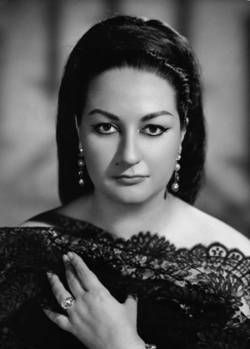 The Chicago Symphony Orchestra family joins the classical music community in mourning Montserrat Caballé, the legendary Spanish soprano, who died on Saturday, October 6. She was 85. 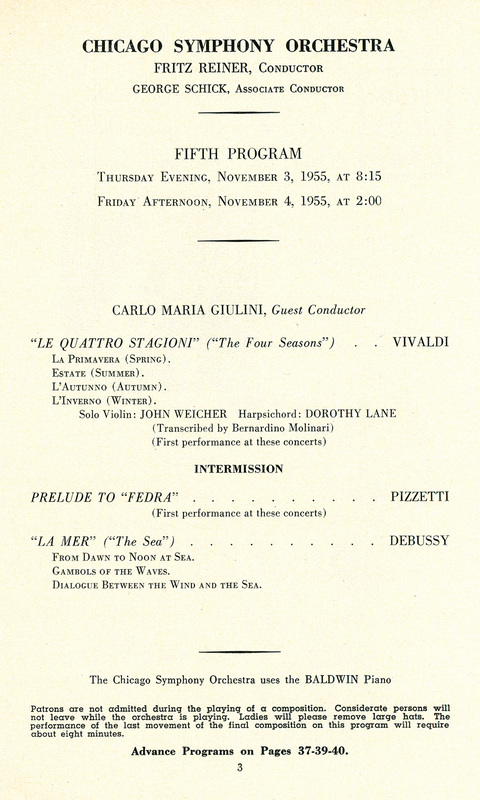 Caballé appeared with the Chicago Symphony at Orchestra Hall on one occasion, on April 28 and 29, 1966, performing Strauss’s Four Last Songs and Weber’s scene and aria, “Ozean! Du Ungeheuer,” from Oberon under the baton of associate conductor Irwin Hoffman. Countless tributes have been posted online, including the Chicago Tribune, The New York Times, BBC News, and Opera News, among several others. The Chicago Symphony Orchestra family notes with sorrow the passing of Alan Stout, composer and longtime composition and theory professor at Northwestern University. Stout died yesterday, February 1, 2018, at the age of 85. 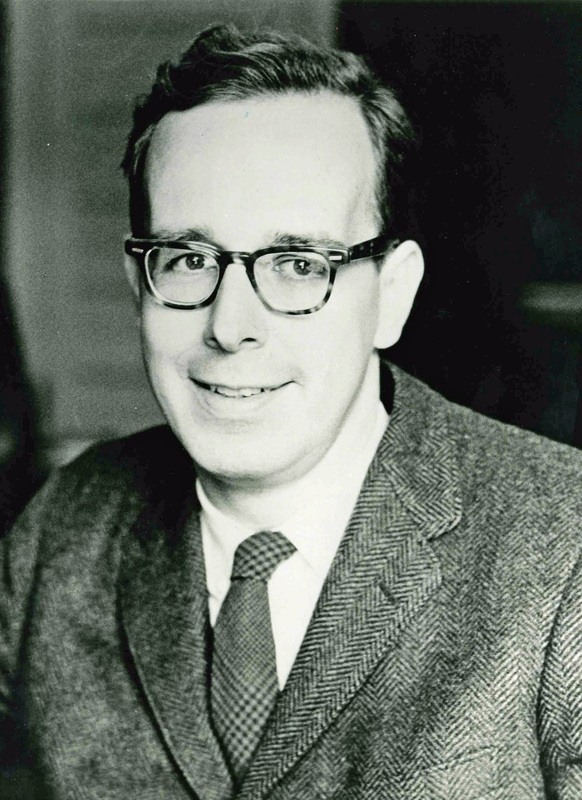 Stout’s music was first performed by the Orchestra on two concerts given at Northwestern University’s Cahn Auditorium on May 29 and 31, 1967, when Esther Glazer was soloist in Movements for Violin and Orchestra with Henry Lewis conducting. 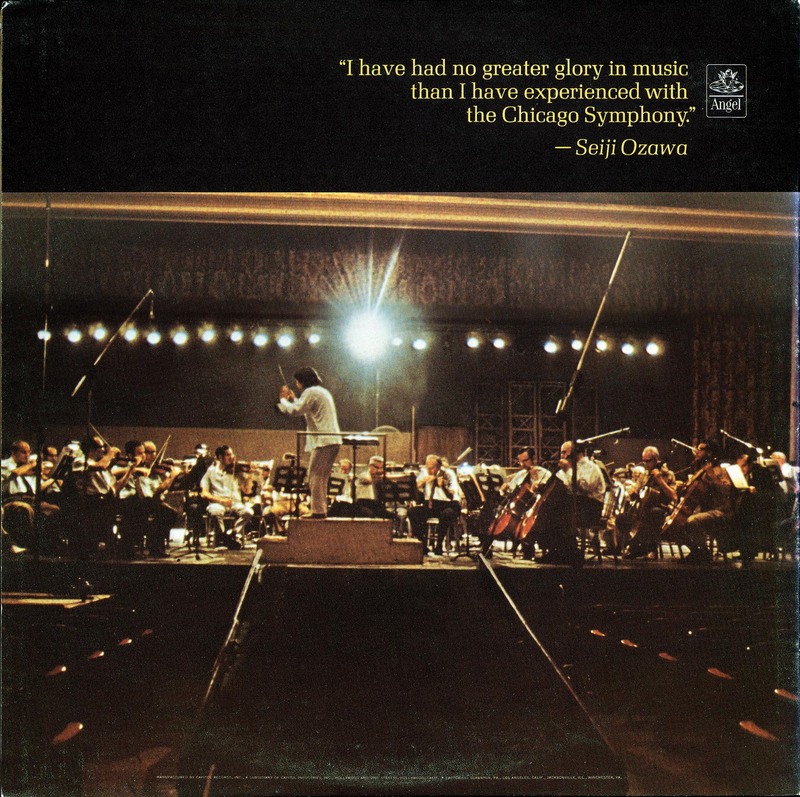 Soon thereafter, the Chicago Symphony Orchestra presented four world premieres by Stout, under the batons of Seiji Ozawa, Sir Georg Solti, and Margaret Hillis, at the Ravinia Festival and in Orchestra Hall. 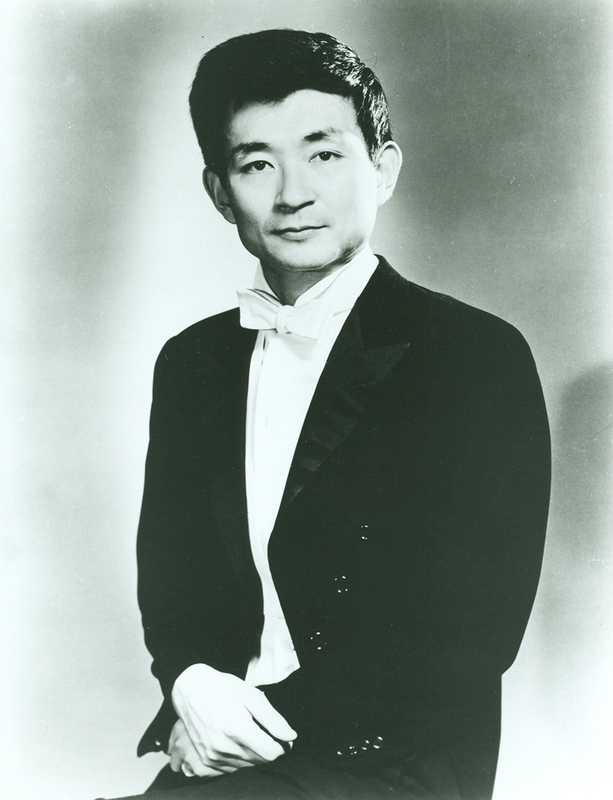 On August 4, 1968, Ozawa led the world premiere of Stout’s Symphony no. 2 at Ravinia. The work was commissioned by the Ravinia Festival Association through a grant from the Illinois Arts Council, and the performance was made possible by a Composer Assistance Grant from the National Endowment for the Arts. 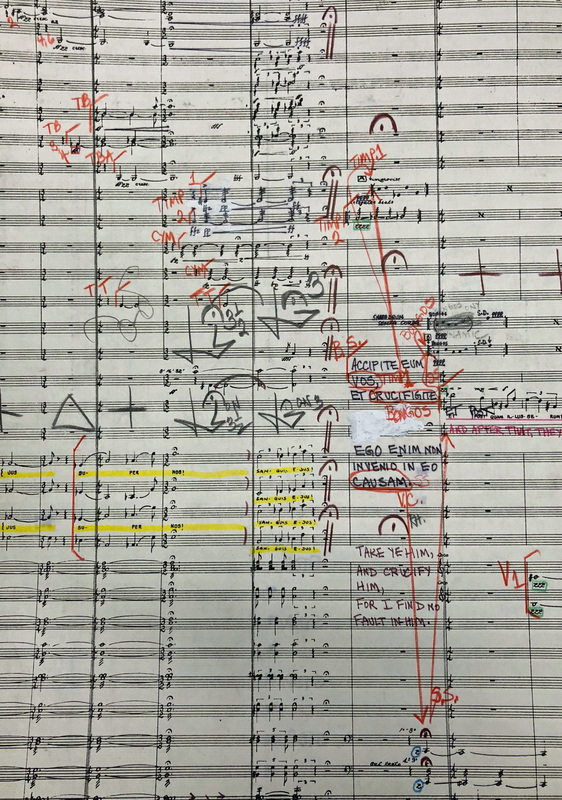 The composer’s Symphony no. 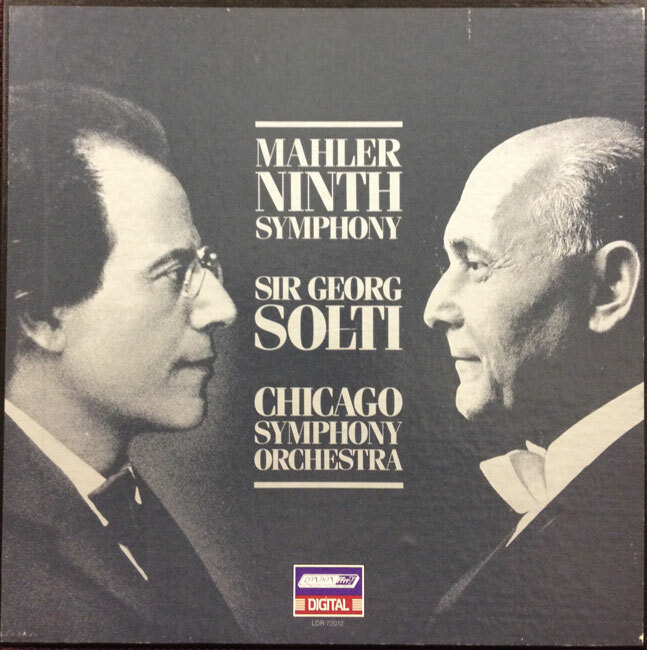 4 was commissioned by the Chicago Symphony Orchestra in celebration of its eightieth season and dedicated to Georg Solti, who led the world premiere performances on April 15, 16, and 17, 1971. The score calls for a small chorus, and members of the Chicago Symphony Chorus were prepared by assistant director Ronald Schweitzer. 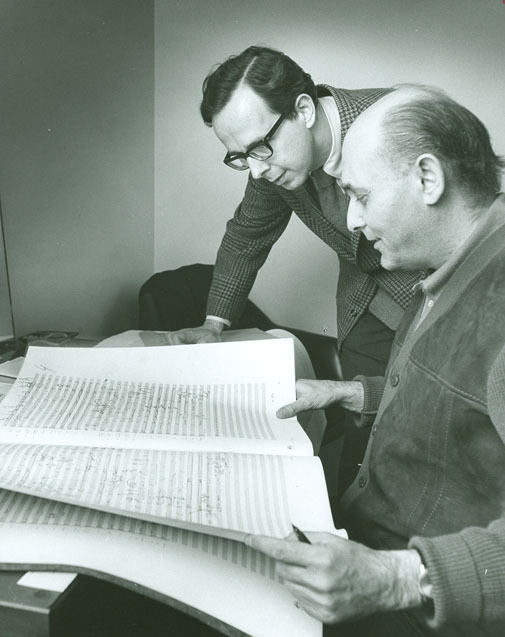 The following year, Solti also led the world premiere of Stout’s George Lieder (Poems from Das neue Reich) on December 14, 15, and 16, 1972, with baritone Benjamin Luxon as soloist. Stout’s large-scale Passion for Soloists, Chorus, and Orchestra was commissioned by the Chicago Symphony Orchestra with assistance from the National Endowment for the Arts and was dedicated to Margaret Hillis and the Chicago Symphony Chorus. 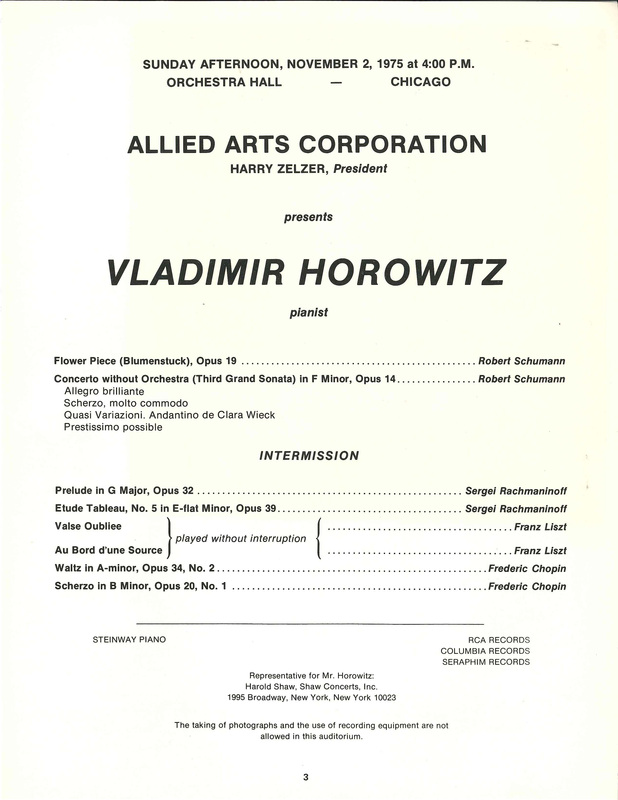 Hillis led the world premiere performances on April 15, 16, and 17, 1976. Soloists included Mary Sauer on organ, Elizabeth Buccheri on piano, along with soprano Phyllis Bryn-Julson, tenors Frank Little and John McCollum, baritones Leslie Guinn and LeRoy Lehr, and bass Monroe Olson. 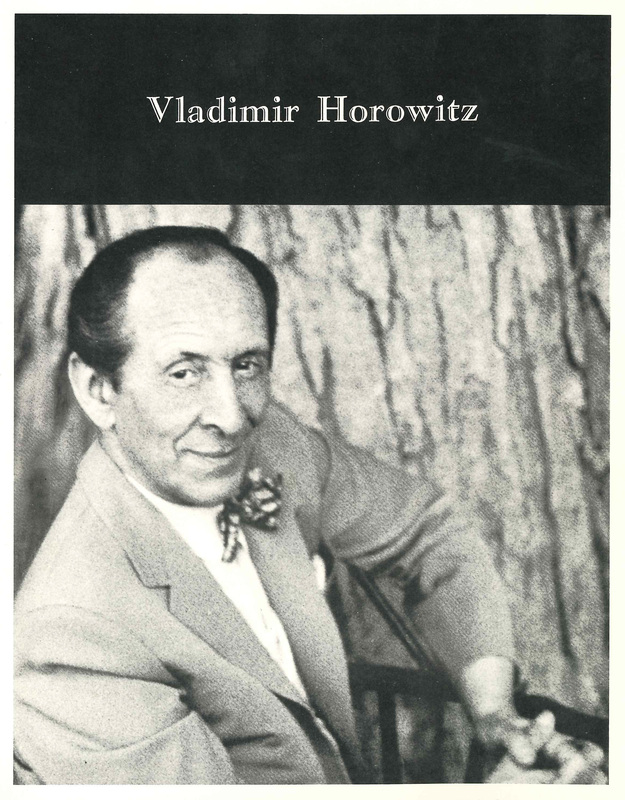 All of a sudden, Vladimir Horowitz is everywhere. Especially in Chicago. 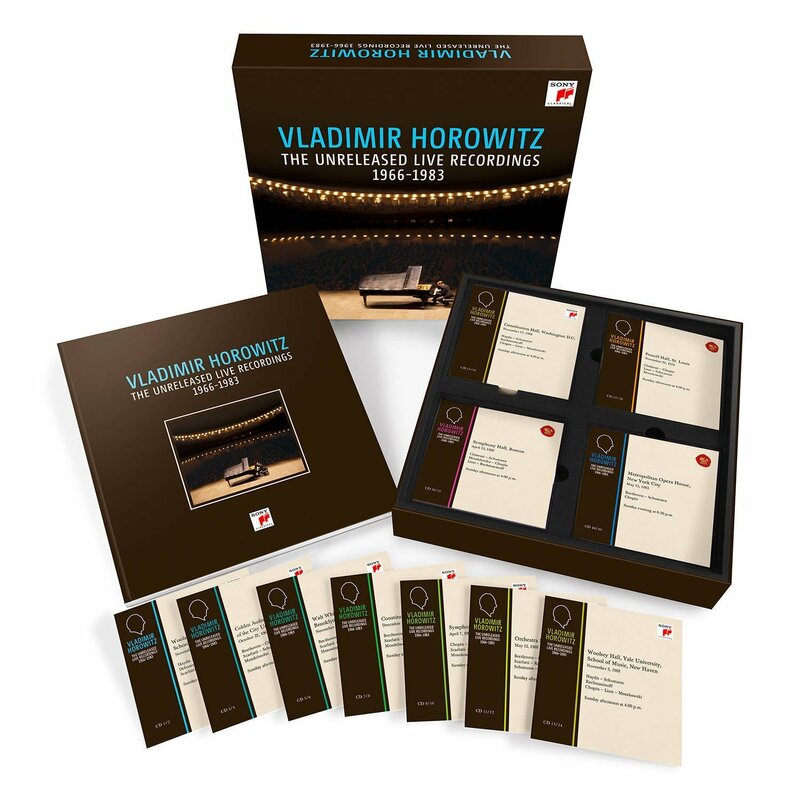 In addition to Deutsche Grammophon releasing Horowitz: Return to Chicago, Sony Classical has issued a set of the pianist’s unreleased live recital recordings, covering thirteen programs recorded at twenty-five concerts in fourteen different venues between 1966 and 1983. And four of those concerts were recorded in Chicago’s Orchestra Hall, on May 12, 1968; November 2, 1975; and April 8 and 15, 1979. These live recordings were made by Columbia Masterworks (1966–1968) and RCA Red Seal (1975–1983), and—with the exception of a few tracks released on compilation albums—the vast majority of the material has never been previously available. The fifty-disc set recently was nominated for a Grammy Award for Best Historical Album. In addition to the works on the program, the audience—including an extra 150 on the stage—demanded no less than six encores: Schumann’s Träumerei from Kinderszenen; Scarlatti’s Sonata in A major, K. 322; Moszkowski’s Étincelles; Chopin’s Black Key Etude in G-flat major, op. 10, no. 5 and Mazurka in A minor, op. 17, no. 4; and finally Rachmaninov’s Étude-Tableaux in D major, op. 39, no. 9. All are included on the release. 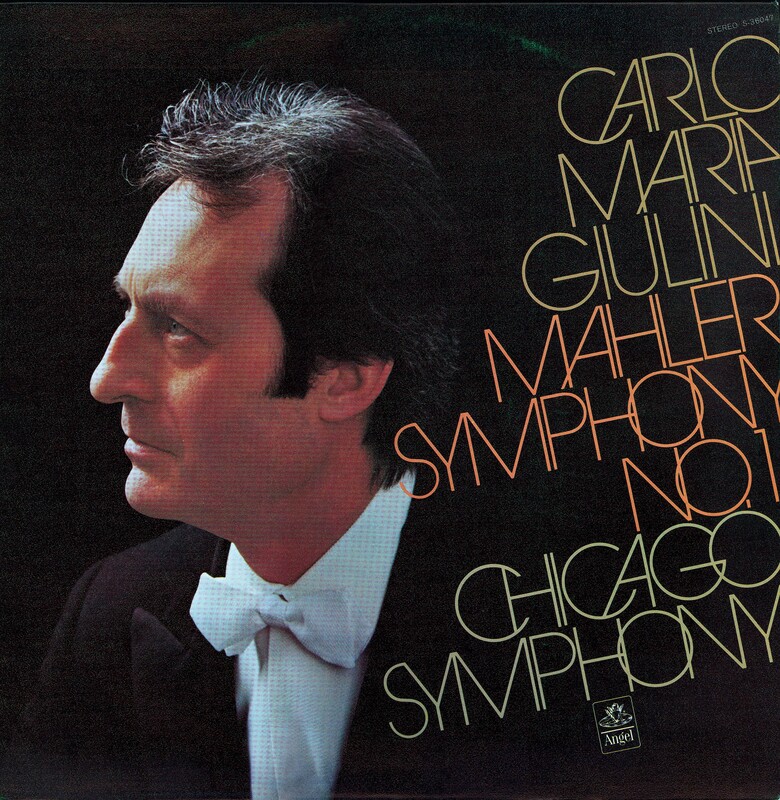 Carlo Maria Giulini made his debut with the Chicago Symphony Orchestra in November 1955, leading two weeks of subscription concerts. In the subsequent years, he was a regular and popular visitor to Chicago, and it was no surprise when he was invited to be the Orchestra’s first principal guest conductor beginning with the 1969–70 season (also Georg Solti’s first as music director). Giulini would serve in that capacity through the 1971–72 season, and he frequently returned to Chicago until beginning his tenure as music director of the Los Angeles Philharmonic in 1978. 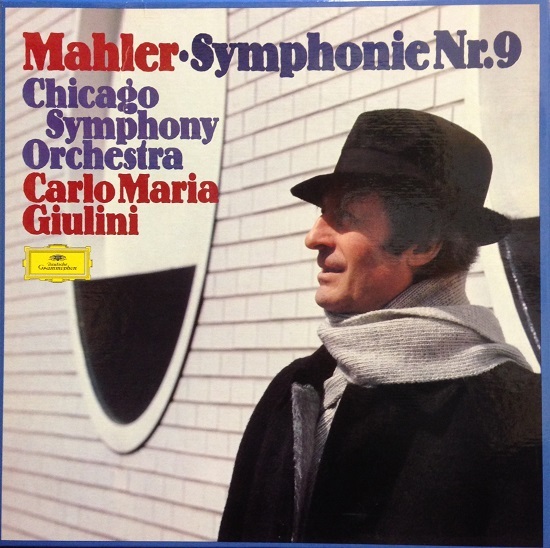 On March 30, Giulini and the Orchestra recorded the symphony at Medinah Temple for Angel Records. 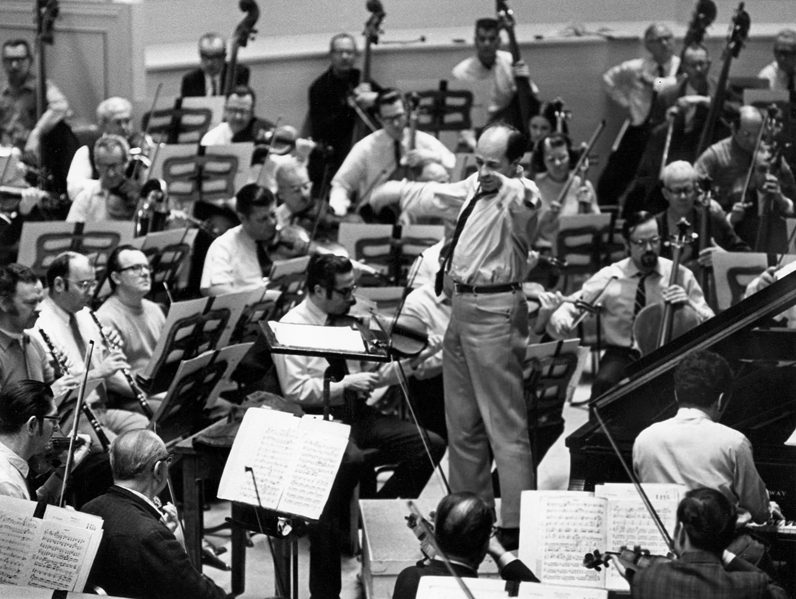 The recording won the 1971 Grammy Award for Best Classical Performance—Orchestra. This article also appears here. 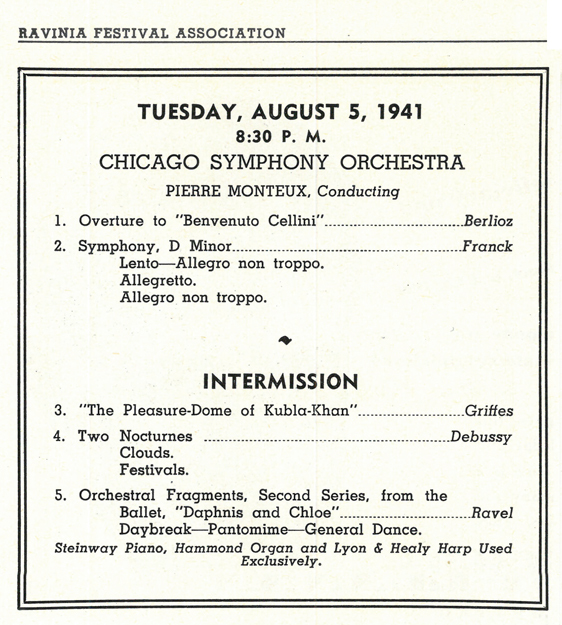 Pierre Monteux made his debut at the Ravinia Festival on August 5, 1941, leading the Orchestra in Berlioz’s Overture to Benvenuto Cellini and Franck’s Symphony in D minor on the first half; after intermission, he changed the program order, leading with Clouds and Festivals from Debussy’s Nocturnes followed by Griffes’s The Pleasure-Dome of Kubla-Khan and Ravel’s Suite no. 2 from Daphnis and Chloe. That first residency also included music by Bach, Beethoven, Brahms, Gluck, Milhaud, and Weber, along with songs and arias by Strauss and Wagner with soprano Helen Traubel. Over the next twenty years, he returned for every season except one (1958), conducting a vast array of repertoire. Monteux brought to the Orchestra his interpretations of works in whose world premieres he had participated, including Stravinsky’s The Firebird (as a violist under Gabriel Pierné) and Ravel’s Daphnis and Chloe and Stravinsky’s Petrushka (as conductor), all with Sergei Diaghilev’s Ballets Russes. The first concert of eighty-six-year-old Monteux’s 1961 residency on July 11 included Debussy’s Prelude to The Afternoon of a Faun, a suite from Strauss’s Der Rosenkavalier, and Beethoven’s Seventh Symphony. In the Chicago Tribune, Thomas Willis reported the Orchestra “played as it always seems to for Mr. Monteux, with flexibility born of affection, considerable vitality, and a limpid, clear tone quality.” For his final concert on July 15, he led Tchaikovsky’s Violin Concerto with Henryk Szeryng, along with Prokofiev and Sibelius’s first symphonies. That evening, Ravinia reported an audience of 7,514—the best attended concert of the season. 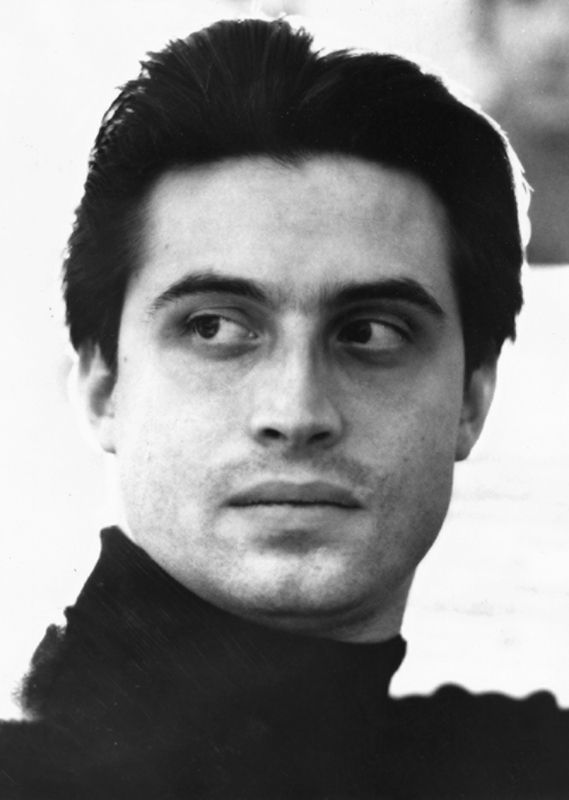 Riccardo Muti made his debut with the Chicago Symphony Orchestra at the Ravinia Festival on July 25, 1973, leading Rossini’s Overture to Semiramide, Schumann’s Piano Concerto in A minor (with thirty-three-year-old Christoph Eschenbach, the festival’s future music director, in his Ravinia debut), and Ravel’s orchestration of Mussorgsky’s Pictures at an Exhibition. Muti’s first Ravinia residency also included Mozart’s Symphony no. 34 and Piano Concerto no. 22 (with Misha Dichter) and Strauss’s Aus Italien on July 27; and Liszt’s Les préludes and Totentanz (with Jean-Bernard Pommier) and Tchaikovsky’s Symphony no. 5 on July 28. 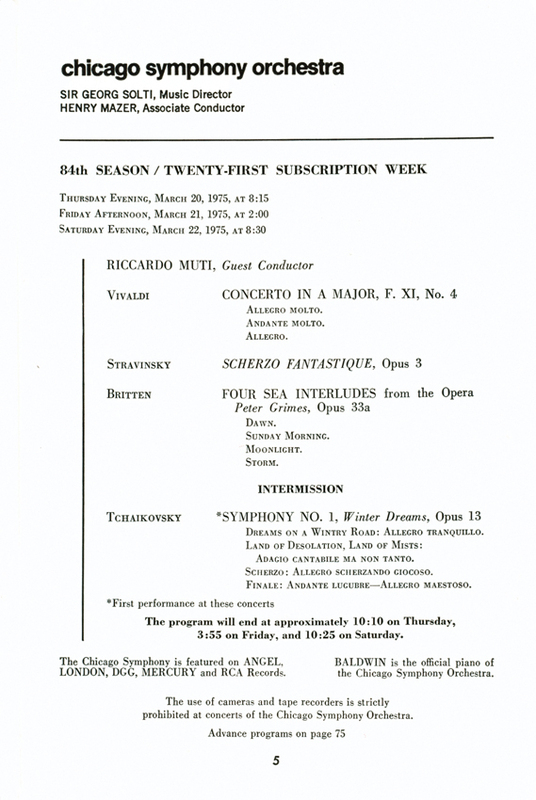 Less than two years later, Muti returned to conduct the Chicago Symphony on subscription concerts at Orchestra Hall on March 20, 21, and 22, 1975, leading Vivaldi’s Concerto in A major for Strings and Continuo, Stravinsky’s Scherzo fantastique, Britten’s Four Sea Interludes from Peter Grimes, and the Orchestra’s first subscription concert performances of Tchaikovsky’s First Symphony. Deutsche Grammophon has released—for the first time on CD—Vladimir Horowitz‘s final recital in Orchestra Hall from October 26, 1986. 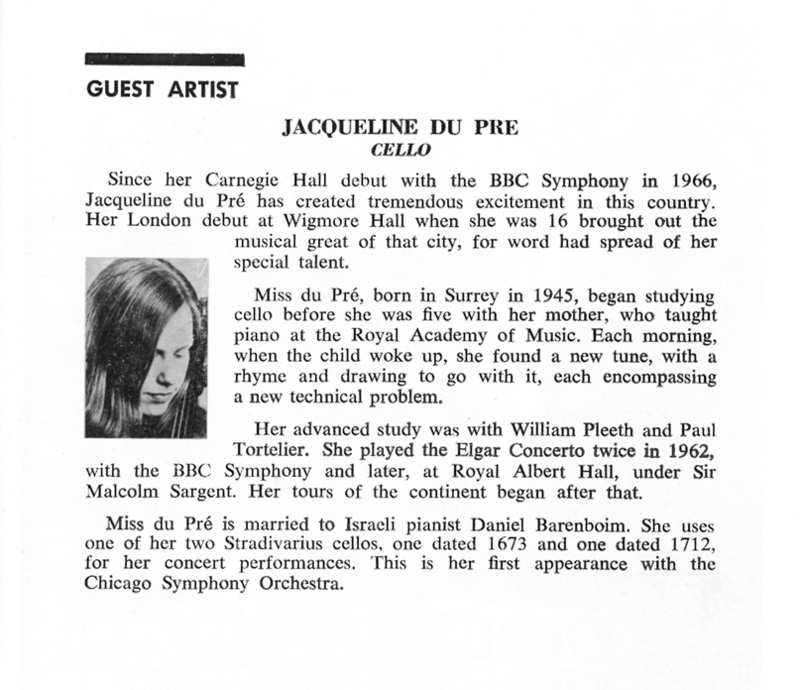 The concert originally had been broadcast on WFMT (Mitchell Heller was the broadcast-recording engineer and producer). For the CD release, Jon Samuels was producer and Matthew Sohn the restoration engineer. The two-CD set also includes two interviews, both of which were excerpted for the 1986 broadcast; on the release, they are included in their entirety. The first is with Chicago Tribune music critic Thomas Willis from October 30, 1974, and the second with WFMT’s Norman Pellegrini from October 25, 1986 (the day before the recital). Both interviews also can be heard here. 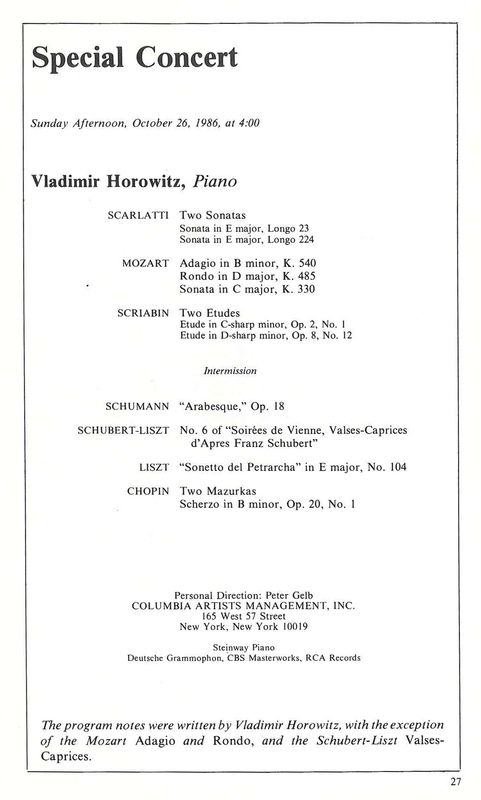 Horowitz’s program for October 26, 1986; Schumann’s Träumerei and Moszkowski’s Étincelles were performed as encores. The complete program is here. 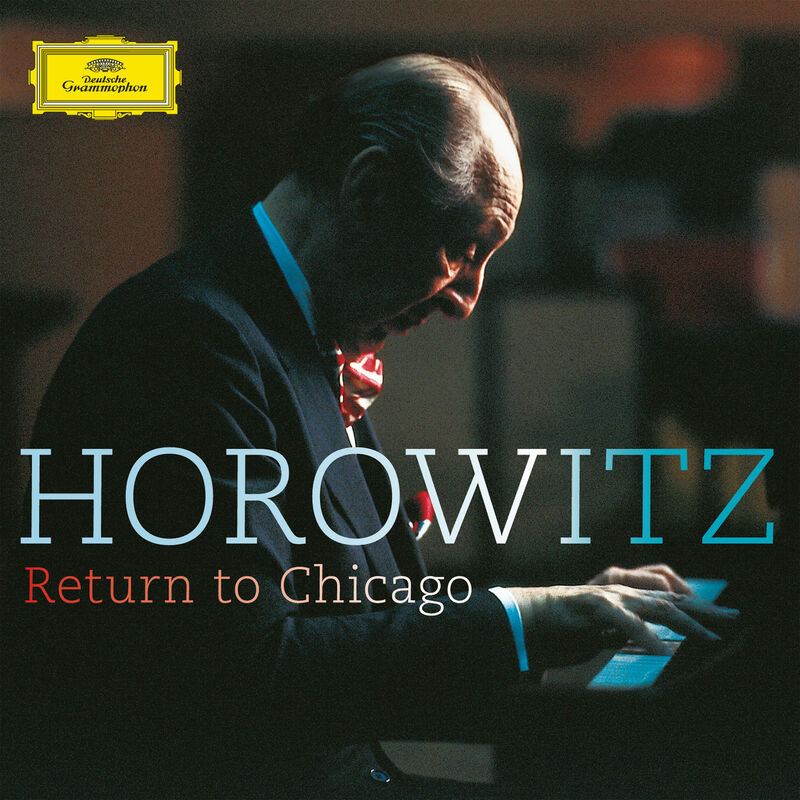 “But there is only one Horowitz, a miraculous, many-faceted artist who delights in surprising us and revealing the plurality of things that enter into his artistry,” added Robert C. Marsh in the Chicago Sun-Times. “Have no doubt, he is still, I am sure, the greatest virtuoso of all. . . . Listening to Horowitz is listening to history. He takes us back to a musical world that, except for himself, is largely gone. I was pleased so many of his listeners were young people. Opportunities for time traveling are always rare. We should savor them.” Both reviews are available here. 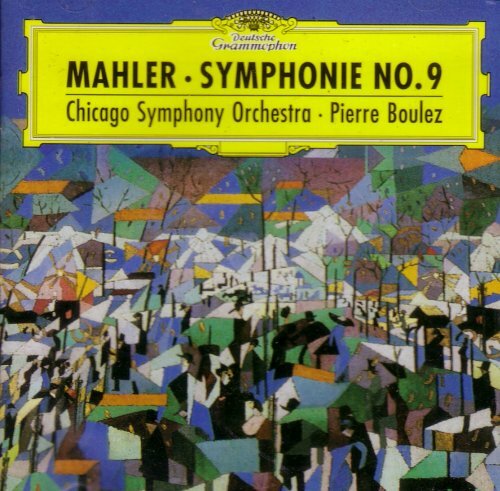 Pierre Boulez’s first conducting appearances with the Chicago Symphony Orchestra in 1969 were greatly anticipated. His book Notes of an Apprenticeship had recently been published in English, and the Orchestra would be performing his music—the U.S. premiere of Livre pour cordes (two movements from his Livre pour quatuor from 1948, reworked in 1968 for string orchestra)—for the first time. As a last-minute replacement for Georges Prêtre in July 1963, Seiji Ozawa was called upon to lead the Orchestra in two concerts at the Ravinia Festival. The twenty-seven-year-old conductor made his debut with the Chicago Symphony Orchestra on July 16 in Beethoven’s Leonore Overture no. 3, Grieg’s Piano Concerto with Byron Janis, and Dvořák’s Ninth Symphony. Thomas Willis in the Chicago Tribune reported that Ozawa was “instantly in command when in possession of a baton and a musical idea. His conducting technique reminds you of his teacher, Herbert von Karajan, in that it lays the score in the lap of the Orchestra with transparency of gesture and human communication, then commands acceptance.” On July 18, he conducted Rossini’s Overture to The Barber of Seville, Tchaikovsky’s Violin Concerto with Christian Ferras, Debussy’s Prelude to The Afternoon of a Faun, Takemitsu’s Requiem for Strings, and selections from Prokofiev’s Romeo and Juliet. 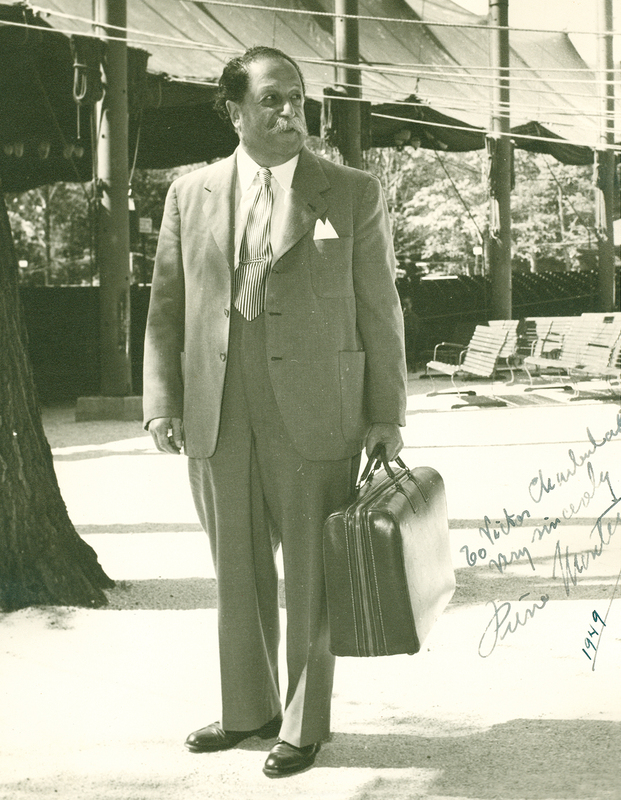 Only a month later it was announced that Ozawa would become the Ravinia Festival’s first music director and resident conductor beginning with the 1964 season, replacing Walter Hendl, who had served as artistic director since 1959. For his first concert as music director on June 16, 1964, Ozawa led the Orchestra in Beethoven’s Egmont Overture, Barber’s Piano Concerto with John Browning, and Berlioz’s Symphonie fantastique. He served as music director of the Ravinia Festival through the 1968 season and as principal conductor for the 1969 season, returning regularly as a guest conductor. Ozawa most recently appeared there on July 14, 1985, leading Mozart’s Rondo for Piano and Orchestra in D major and Takemitsu’s riverrun with Peter Serkin, along with Tchaikovsky’s Pathétique Symphony. 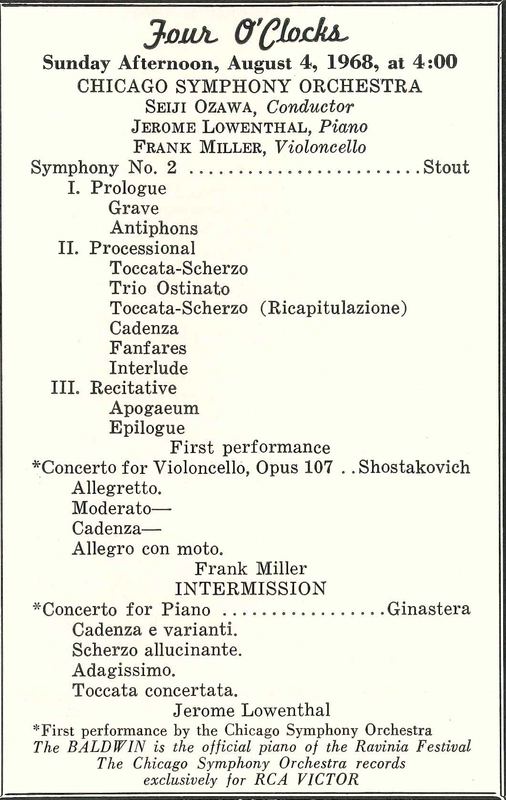 Between 1965 and 1970—at both Orchestra Hall and in Medinah Temple— Ozawa and the Orchestra recorded a number of works for both Angel and RCA, including Bartók’s First and Third piano concertos and Schoenberg’s Piano Concerto with Peter Serkin, Beethoven’s Fifth Symphony, Lutosławski’s Concerto for Orchestra, Ravel’s orchestration of Mussorgsky’s Pictures at an Exhibition, Rimsky-Korsakov’s Sheherazade with concertmaster Victor Aitay, Stravinsky’s The Rite of Spring, and Tchaikovsky’s Fifth Symphony. Some of this content was previously posted here; this article also appears here.